The US commercial space industry did not fare well last week. Two accidents on 28th and 31st October highlight the risks, costs, and difficulties of spaceflight—as well as pointing to potential setbacks for commercial spaceflight. (If you’re interested, other news outlets have commented on these issues as well, such as here and here and here.) Pardon the self-promotion, but you can check out our discussion with Ken Kremer on a Weekly Space Hangout with Universe Today on the 31st for more information. First, on Tuesday (the 28th), an unmanned 13-story rocket designed by Orbital Sciences Corp. exploded a few seconds after liftoff off the coast of Virginia at NASA’s Wallops Flight Facility. It carried a Cygnus capsule with more than 5,000 pounds (2,300 kg) of hundreds of millions of dollars of supplies and equipment, as well as school students’ science experiments. It was bound for the International Space Station (ISS) and was the first time a resupply mission contracted by NASA to a private company failed. Fortunately, no one was hurt. Though the flight facility is designed to handle explosion and fire, there was significant damage to the launch infrastructure. It will take time to recover from this. And we will have to see how much this damages Orbital Science Corp.’s reputation and NASA’s efforts to outsource orbital flights. Four previous Antares flights, including three to the station, had launched successfully, and five resupply flights remain in the company’s multi-billion dollar contract, the next one being scheduled for April. This likely will be delayed though, and according to Orbital’s press release, they will implement a propulsion system upgrade previously planned for 2016. The loss of this supply vessel doesn’t pose an immediate problem for the ISS’s crew, which includes two from NASA, one from the European Space Agency (ESA), and three Russians. The second US supply line to the ISS is with Space Exploration Technologies (SpaceX), which has its next launch planned for 9th December. Although the ISS crew and their missions are not in any danger, this loss significantly affects Orbital Sciences, and more work and investment will be needed to proceed. NASA held a press conference the same day as the accident, and their investigation into the cause(s) of the explosion and failed launch continues. These space-bound rockets have many components—many things that could go wrong—and there is considerable debris to examine, so it could take awhile. It’s not clear whether extra weight and length were factors in the accident, for example. A turbopump-related failure in one of the two Aerojet Rocketdyne AJ26 stage-one engines might have been the culprit. These liquid oxygen and kerosene fueled engines, produced during the Soviet era in Russia (with modifications), likely will be discontinued in future Antares rockets. And now for Act Two. Virgin Galactic’s SpaceShipTwo, part of a commercial space program founded by Richard Branson, suffered an “in-flight anomaly” on Halloween. 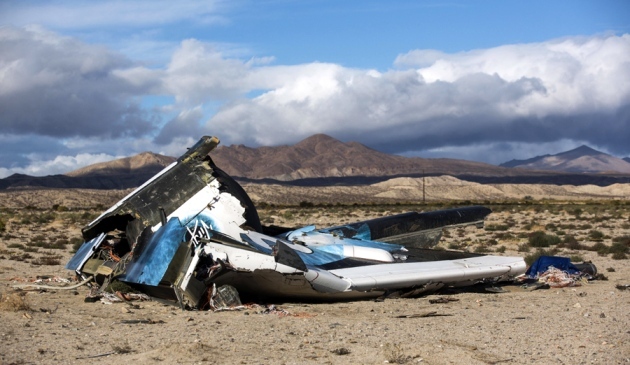 It crashed midflight during testing and broke into several pieces over the Mojave Desert (north of Los Angeles, for you non-Californians). One pilot (Michael Alsbury) was killed and was unfortunately still strapped to his seat in the wreckage. The other pilot (Peter Siebold) successfully ejected at an altitude of around 50,000 feet and deployed his parachute. He was airlifted to a hospital and treated for injuries. After successful programs like Mercury, Gemini, and Apollo, NASA has been attempting to privatize spaceflight and redefine its missions partly because of tighter budgets over the past couple decades. According to the NY Times and Lori Garver (former deputy administrator at NASA), public funds should be focused on activities that advance technology and provide public benefits to all, like planetary science. At the same time, Garver said, the government should encourage private companies to move ahead and find innovative ways of reducing costs. The National Transportation Safety Board (NTSB) held a press conference last Sunday with more details. A new fuel was being tested on this flight, which may or may not have been an issue, and a “feathering mechanism” might have been deployed prematurely on the spacecraft, when it was traveling beyond the speed of sound. But the investigation is still in progress, and I’ll give you more details in the near future. In any case, our thoughts are with the pilots and their families. So what does the future hold? I’m not sure, but it looks like Orbital Sciences (and SpaceX) and Virgin Galactic will continue their spaceflight programs, as they should. Both of these accidents are unfortunate and costly—to say the least—but they should not deter us from space exploration. We have much to gain from continuing these programs. At the same time, I think we should be careful about outsourcing too much; I believe that our best prospects lie with continuing to invest funding, resources, and personnel in NASA, ESA, and other space agencies, where our scientific expertise and oversight are the greatest, and where short-term setbacks are less likely to affect our long-term objectives or derail whole exploration programs.